The lead designer of Deus Ex: Human Revolution says the previous game in the series, Invisible War, was "fun to play" but "too futuristic" to resonate like the original. 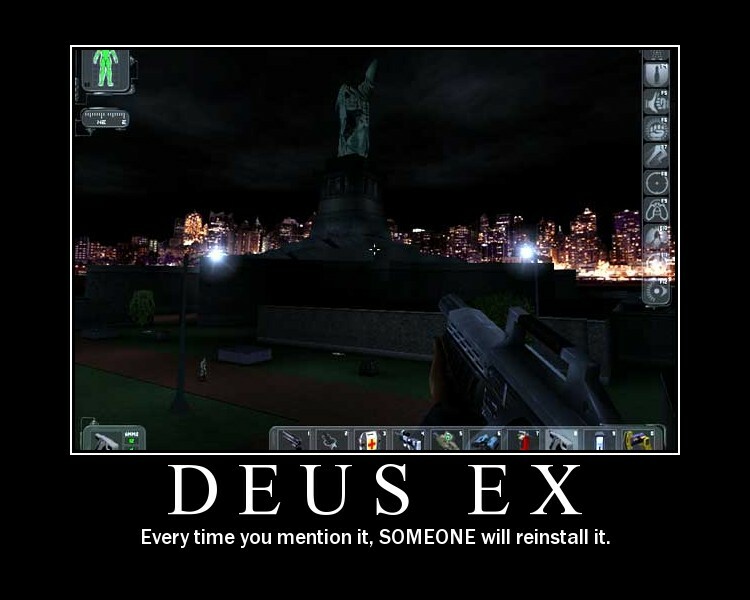 There's a well-known Deus Ex demotivational poster that's been around for awhile featuring a panoramic nighttime view of the New York City skyline and, in the foreground, the game's most iconic image: The decapitated Statue of Liberty. Underneath lies the words, "Deus Ex: Every time you mention it, someone will reinstall it." It's amusing, in part because it's also not really an exaggeration. In spite of its many flaws, once it's sunk its claws into a gamer, it never entirely lets go. That's not really the case for the follow-up, Deus Ex: Invisible War, however. Invisible War was a reasonably decent, enjoyable game that probably would have fared much better in the eyes of critics and gamers alike if it wasn't saddled with the family name. But it was and as a result, in the eyes of fans it will forever be emblematic of how not to do it. Fortunately, Jean-Francois Dugas, the lead designer on the upcoming Deus Ex: Human Revolution, isn't oblivious to its shortcomings. Invisible War had a "good level of multi-path, multi-solution, and was actually fun to play", he said in an interview with PC Gamer. "What didn't help was that at the start of the game you don't know who you are, what your background is, or what you're doing in the world. It takes hours before you can make sense of your identity. I think it was maybe too hard to absorb and immerse in that world because it took so many hours." "It was more futuristic and less grounded in a reality that we can relate to. I'm not talking about universal ammo - that's a whole different debate - it's more about the broader appeal," he continued. "In the first Deus Ex you have an identity already clear in your head. You're a super-soldier, you work for UNATCO, a branch of the UN. It's the near future, and you immediately see the Statue of Liberty with its head on the ground. There's something strong that you can relate to that Invisible War lacked." And how about that much-debated universal ammo that showed up in Invisible War? "We don't have universal ammo," Dugas said. Deus Ex: Human Revolution is scheduled for release in early 2011 for the PC, Xbox 360 and PlayStation 3.